A playlist is a collection of videos. Playlists can include videos from your channels or others. Playlists are usually used to organize videos with similar content. 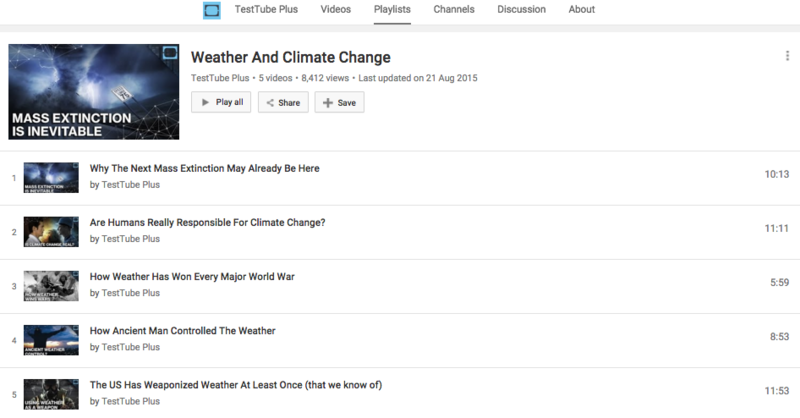 For example, below is a playlist consisting of videos on climate change by TestTube Plus . Playlists allow viewers to watch a string of videos in one sitting. Thus, they are extremely useful to engage viewers and increase watch-time. Watch-time is an important ranking factor on YouTube. This means, YouTube increases the rankings of videos that retain viewers for a long time. But what is the connection between playlists and watch-time? Playlists auto-play to the next video. As a result, viewers tend to watch more videos per sitting. Therefore, playlists improve search rankings by increasing YouTube watch-time. YouTube allows creators to link related videos at the end of every video. To increase watch-time, include a link to a themed playlist instead. When users click on the playlist URL, they will be directed to the playlist player. Use end cards in your video to insert your playlist URL. For instance, take a look at playlists by Boyce Avenue. 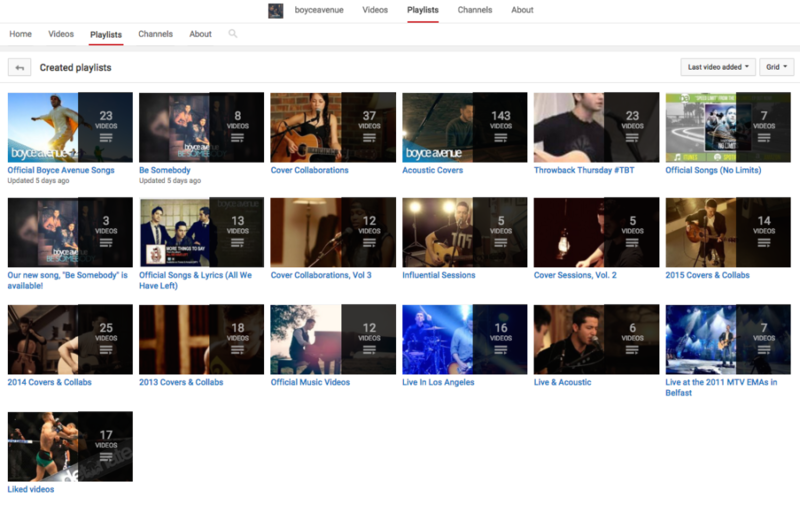 The band has organized collab videos, acoustic covers and live sessions into separate playlists. Thus, viewers can choose to watch a playlist of their liking. Use keywords in your playlist title. Write a detailed playlist description. Like your video description, include keywords that you want your playlist to rank for. Follow the fundamentals of video descriptions when writing a description for your playlists. Add an optimized thumbnail image for your playlist. Unfortunately, YouTube does not allow you to create customized thumbnails for playlists. Therefore, select the best image in the playlist and set it as your thumbnail. Include your best videos at the beginning of the playlist. This will grab the viewers’ interest and compel them to watch more videos. Trim excess information. YouTube allows creators to choose the start and end time of every video in the playlist. Thus, you can remove unnecessary content to provide a seamless viewing experience. Follow the above measures to benefit from increasing watch-time. Use YouTube Analytics to determine how your playlists are doing. Go to Traffic sources and YouTube Playlists. You can track the number of views, minutes watched and average view duration. The goal is to change your playlist strategies if the results are disappointing. In conclusion, playlists are a great way to retain viewers to your channel. Therefore, follow the above effective strategies to improve your videos’ search rankings using playlists. Manasa Boggaram is a writer and has a strong passion for music, positive news and constructive journalism. When she is not researching story ideas or writing blog posts, she spends her time reading books, discovering new music and eating lots of street food.